A rally was held at the United States Capitol in Washington, D.C. to mark the 15th anniversary of the Communist Chinese regime’s persecution of Falun Gong. These leaders, along with thousands of Falun Gong practitioners, attended, sent letters, and made speeches to call for an end to the Chinese Communist Party’s (CCP’s) crimes against humanity. Chloe Schwenke, vice president of global programs at Freedom House, stated in her speech, “We at Freedom House applaud these values [Truthfulness-Compassion-Forbearance] as exemplified by Falun Gong practitioners and their long struggle for dignity and freedom.” Freedom House awarded its 2001 International Religious Freedom Award to Mr. Li Hongzhi, founder of Falun Gong. The pressure to do something about the forced organ harvesting of Falun Gong adherents and other prisoners of conscience was mentioned often and by nearly all the speakers. In the House of Representations, HRes 281, calls for China to immediately end the practice of organ harvesting of all prisoners, particularly Falun Gong, and it calls for a full and transparent investigation by the State Department. And it has garnered the “significant bipartisan support” of 182 cosponsors, said Congresswoman Ileana Ros-Lehtinen (R-Fla.). 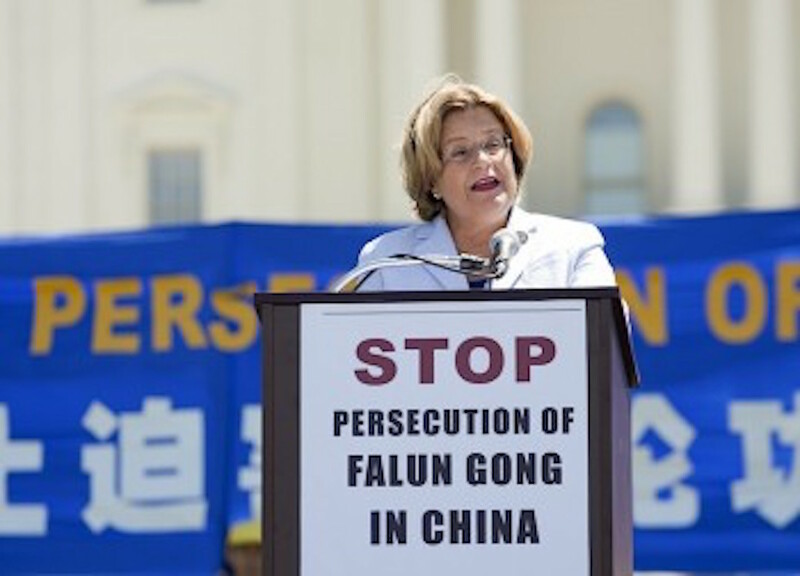 Kansas Congresswoman Lynn Jenkins said: “The atrocities being carried out on the Falun Gong practitioners in China is reprehensible. The practice of non-consensual organ harvesting is, for many of us, materials for nightmares or horror films. But hundreds and thousands of Chinese families who have brothers, sisters, parents, grandparents, or friends who are locked away in detention camps for practicing Falun Gong, this nightmare is very real. Your support for these victims can generate social change. Your voices have already reached the shores of China. I want you to know that the American Congress stands behind you and your effort to counter the Chinese Communist Party and the abuses, and change the dangerous rhetoric surrounding the Falun Gong practice,” she continues in her support letter that her assistant read at the rally. Many members of Congress and the House of Representatives spoke at the rally, and even more sent statements of support, including Wisconsin Senators Ron Johnson (R) and Tammy Baldwin (D), and Pennsylvania Senator Patrick Toomey (R), Rosa DeLauro (D-Conn.), Adam Smith (D-Wash.), Bill Pascrell (D-N.J.), Rush Holt (D-N.J.), Gwen Moore (D-Wis.), Keith Ellison (D-Min. ), Paul Tonko (D-N.Y.), Leonard Lance (R-N.J.), Gerald Connolly (D-Va.), Joseph Heck (R-Nev.), Reid Ribble (R-Wis.), Vicky Hartzler (R-Mo. ), Robert Pittenger (R-N.C.), Rep. Lynn Jenkins (R-Kan.), Ileana Ros-Lehtinen (R-Fl. ), Donald Payne (D-N.J.), Sam Farr (D-Calif.), Blaine Luetkemeyer (R-Mo. ), former White House senior advisor in the George W. Bush administration, Bob Baltazar, Kansas Congresswoman Lynn Jenkins, New York State Senator Tony Avella, California Congressman Dana Rohrabacher, Chairman of the Human Rights Committee of the House of Representatives, Congressman Chris Smith, Robert Menendez (N.J.), and Bill Foster (D-Ill.). Several Humans Rights organizations were also represented at the rally, such as the Religious Liberty Programs at the Institute on Religion and Democracy, Martha Flores-Vazques, the District Leader in Queens County, New York, and Executive Director of Community Prevention Alternatives for Families in Crisis, Yi Rong, president of the Global Service Center for Quitting the CCP, Dan Fefferman, president of the International Coalition for Religious Freedom, William J. Murray, chairman of the Religious Freedom Coalition, Chloe Schwenke, vice president of global programs at Freedom House, Suzanne Scholte, president of the Defense Forum Foundation, and Wang Zhiyuan, the spokesperson of WOIPFG (World Organization to Investigate the Persecution of Falun Gong).